Today we mark a milestone in our much beloved series. I, your average Manhattan children's librarian, have given to you hot authors, illustrators, publishers, and editors. But the term, "Hot Men of Children's Literature" is a flexible all-encompassing moniker. Why limit ourselves to the real world when the virtual one offers us just as many joes to pick from? I'm talking about kid lit bloggers, of course. Bloggers that will one day be published and become famous authors allowing us the chance to say that we knew them back when. Much better! Now you can see Mr. Asher (second from the end on the left) with his various cohorts. You've got your Robin and your Eve and your Lisa Yee (can you tell which blog I swiped these from?) and your fellow attractive blogger Gregory K of Gotta Book. But the ladies who are not Lisa Yee represent the two branches in the triumverate that is Disco Mermaids. 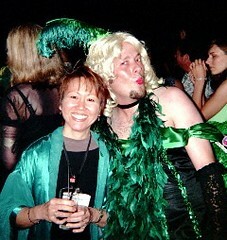 And once a year they make Jay dress in drag (hence the previous photo). I'm not entirely certain why. I think it must be a California thing, since that's where they're all from. Or it could be because the SCBWI Conference has a costume contest each year. Something like that. Anywho, Mr. Asher writes and posts thoughts on the process on his blog regularly. You are encouraged to do the Check It Out thing. A tip of the hat to an all around swell fella. What a wonderful choice. In the words of Paris Hilton, and I am paraphrasing, "There's nobody good here, so I'm going to pretend to be talking on my cell phone." Oops. I meant, "That's hot!" We've always considered Jay our own "hot man" but we're glad to share him with the world! Thanks for noticing one-third of our hotness! Ah! And I almost didn't recognize him without the Farrah do, and dress. I fractured my metatarsal at this year's SCBWI conference jumping off a stage with the aforementioned "Hot Man" (who is not just hot, but is incredibly funny and wonderful as well) and when people asked me how I did it I amused myself by telling the truth: "Well, I jumped off a stage to get jiggy with a man dressed as a saloon girl with a blonde wig and fishnet stockings." Yes. Few people know about my Do His Legs Look Good In Fishnets? requirement when it comes to my Hot Men. Christopher Paul Curtis, for example, sports dandy calves whereas Mo Willems just barely earned himself a slot on the list due to his shapely ankles. I certainly can't hold a candle to Jay in fishnets, but I'd like to point out that in that group picture, I'm THINKING of fishnets. Still, I must tip my cap to you, Fuse, for giving Jay his very, very well deserved due. Thank you, Fuse, for making today so wonderful. Robin and Eve took me out to lunch and agreed to refer to me as His Royal Hottness for an entire hour. The librarians I work with agreed not to point and say, "You?" more than once. And my wife agreed to try real hard to keep her eyes from rolling and keep her snickers to a minimum. Tomorrow, of course, everything goes back to normal...but I've still got a few hours left of gloating today! Awww. See? That's how it should be. From now on I'm only doing fellers who would WANT to be HMOCL.